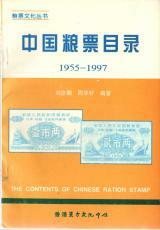 There are no books about Chinese ration coupons in western languages (please correct me if I am wrong). 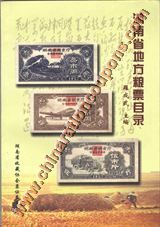 There is a good resource devoted to the study of rationing, the International Journal of Rationing, and in there a very useful Bibliography of Chinese Ration Currency by Marius Bochniak, listing many books and catalogues in Chinese language. (INTERNATIONAL JOURNAL OF RATIONING, VOL. 1, NO. 4, 2009). (This is a PDF file, you need an Adobe Reader to see it, free downoad from Adobe here). 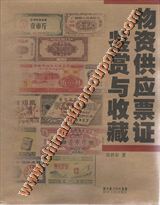 If interested in Chinese books on Chinese ration coupons I recommend this article. Some of the titles listed there and some other titles I offer below. Further there are articles by Martin Wolfgang Trott published in German language in the Journal MONEYTREND. The author provided me his files, they might differ slightly from the published articles in Moneytrend in layout and minor corrections. Here books that I can provide for you. Shipping China Post registered airmail, SAL or seamail is NOT included in the prices, please request. Click the pictures to get to the content and sample pages! Please be aware that ALL below books are in Chinese language only! 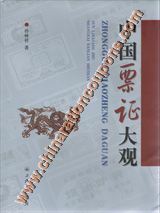 Still many of those titles can be of use to the non Chinese reader due to pictures, prices etc. 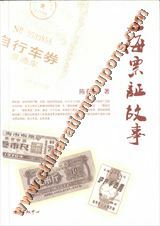 Zhong guo liang piao jiao yi da quan, [Complete trading information of Chinese grain coupons], 2006, 62 p.
Small grain ration coupon catalogue by provinces with prices and selected blue and white pictures. 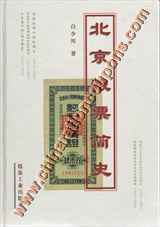 Shan xi sheng liang piao mu lu [Catalogue of Grain Coupons of Shanxi Province], Gumin, 2001, 194 p., by the Coupons Collection Committee of Taiyuan Collectors Association. 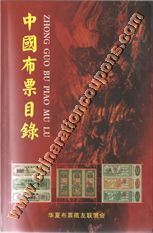 This work on one single province (Shanxi) is much more detailed than the usual catalogues and contains coupons from all kinds of different coupon emitting institutions. Pictures only black and white. Zhong guo liang piao mu lu 1955-1997, [Chinese Grain Coupon Catalogue 1955-1997], by Zhou yan qing and Zhou hua, 1999, 104 p., Hong Kong East cultural center. Catalogue by provinces with prices without pictures. Xin	zhong	guo sheng	ji	liang	piao	mu	lu, [New Catalogue of Province Level Grain Coupons of the People's Republic of China], 2009, 183 p. by the Chinese Collector's Association Coupon Collection Committee. Catalogue by province, no pictures, indication of rarity with stars from 1-5. The most recent catalogue. 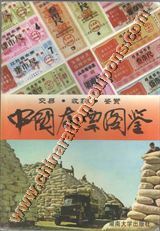 jin wan piao	zheng [Modern Collectibles: Ration Coupons], 2000, 108 p.
All color plates! Lage A 4 size. 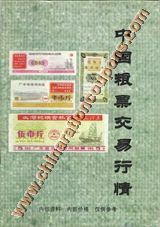 General introduction to Chinese ration coupons, good overview over the great varieties of different coupons, with chapters for coupons for high priced consumer durables, articles for daily use, coupons for marriage articles, for holiday purchase, overseas remittances, etc. Memory of special times - coupons. 2 Vols., by Li Xiangsun and Li Jinling, Haitian Publishing House. 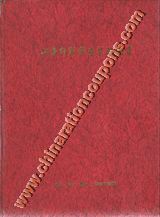 Black book: Grain and Oil coupons, 1999, 193 p.
Red book: Comprehensive Coupons, 1999, 219 p.
Both books all color plates. Includes meat-, tobacco-, alcohol and many other coupons. Hu bei sheng bu mian xian piao tu (mu) lu, Picture Catalogue of Cloth\Cotton and Thread Coupons of Hubei Province, 2002, 192 p. by Hua xia bu piao zang you lian yi hui. Very detailed catalogue of one single province with (all?) different emmitents of cloth, cotton and threat coupons of Hubei province, black and white pictures of all coupons. 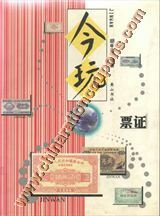 Piao zheng shou cang yu tou zi, Coupons Collection and Investment, Lu Keqin, 2003, 512 p., Baihua Literature and Art Publishing House. Enormous volume with color plates and black and white pictures, ordered not by province but thematically. 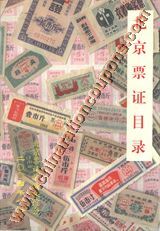 Shang hai piao zheng gu shi, Stories about coupons in Shanghai, Lu Chunfang, 2009, 193 p., Oriental Publishing Center. Interesting stories about coupons in everyday Shanghai people's lives. Black and white pictures. 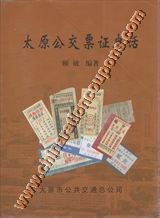 Zhong guo bu piao tu jian, Picture Catalogue of China Cloth Coupons, Gu Songlin and Li Xu, 2000, 288 p., Hunan University Publishing House. All color plates for all coupons by province with prices, probably the best Catalogue on cloth coupons! 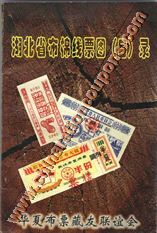 Hu nan sheng di fang liang piao mu lu, Catalogue of Hunan Province Local Grain Coupons, Luo Chengwu, 2003, 136 p., Hunan Province Collectors Association's Coupon Committee. 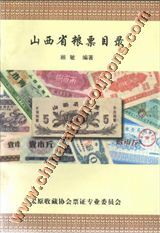 As with all catalogues dealing with one province only, this is more detailed including issues of many different grain and oil coupons issuing institutions on provincial, city and prefecture level of Hunan province. 23 pages of color plates. 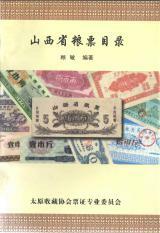 Zhong guo liang piao tu jian, Picture Catalogue of China Grain Coupons, Cao Qianli, 2001, 137 p., Hunan University Publishing House. 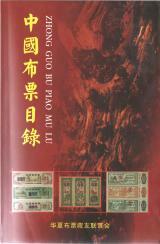 Piao zheng gu shi, Stories on Coupons, Gao Lilin, 1998, 457 p., China Literature Publishing House. A great amount of short stories about the use and issuing of coupons of everyday coupon users, some funny, some sad, some absurd! 16 color and black and white plates. 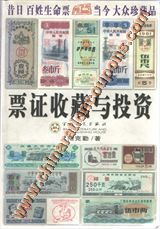 Zhong guo liang piao jiao yi hang qing, The m´Market Prices of China Ration Coupons, no date, 46 p.
Little catalogue, few black and white pictures, sorted according to province, with prices. 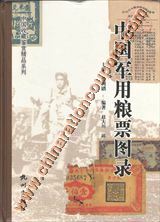 Zhong guo jun yong liang piao tu lu, Picture Catalogue of China Military Grain Coupons, Zhao Dachuan and Qiu Yunfei, 2007, 357 p., Hangzhou Publishing House. Beautiful oversize hardcover book, all color plates. Tai yuan shang pin piao zheng, Commodity Coupons of Taiyuan City, 1953-1992, Zhang Guiyuan and Yang Zhenwu, 2000, 186 p., China Commerce Publishing House. Big size (A4) hardcover book, all color plates. All(?) coupons used in Taiyuan city, from general China and Shanxi province coupons to city and local institutions ones. 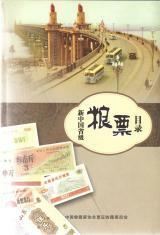 xiao shi de piao zheng, Dissipating coupons, Lu Keqin, 2008, 149 p., Xueyuan Publishing House. Black and white pictures, 10 color plates. 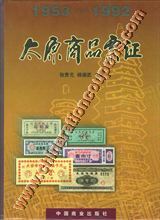 Liang piao, liang jia, Grain coupons, grain price, Tang Zhong and Song Jiqing, 1992, 124 p., Publishing House of the Pepole's University of China. Small booklet, not a catalogue, no pictures, but essays about rationing. 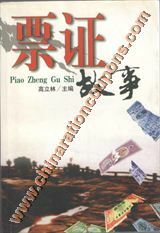 Liang piao jia ge gai yao, Grain Coupon Price Outline, 2000, 306 p.
Bei jing liang piao jian shi, A Brief History of Beijing Grain Coupons, Bai Shaochuan, 2000, 78 p., Coal Industry Publishing House. Small hard cover book, text and 27 p. color plates. 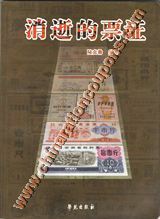 Piao zheng tu an quan shi, Explanation of the Designs of Coupons, Li Maizhu, 2001, 154 p.
Zhong hua ren min gong he guo yu lu liang you piao quan tu lu, Illustrated Catalogue of Chinese Grain and Oil Coupons with Yulu [quotations of chairman Mao], Zhou Shunan and Jiangjun, 1999, 222 p., Oriental Culture Center of Hong Kong. 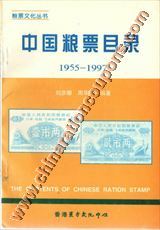 Non complete catalogue of chairman Mao quotation coupons (mostly 1968-1971), with black and white pictures and prices. 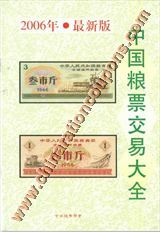 Bei jing piao zheng mu lu, Catalogue of Beijing Ration Coupons, 2004, 48 p. and 8 color plates, by the Beijing Coupon Collection Fraternity. 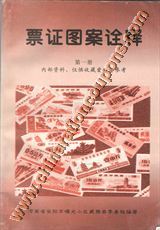 Little book listing 27 different kinds of coupon categories with different years and issuing institutions used in Beijing. Zhong guo liang piao mu lu, China Grain Coupons Catalogue 2003-2004, Xu Guang, 2003, 139 p., Heilongjiang Province People's Publishing House. Catalogue by Province, all color plates, but not with pictures for each and every coupon, with prices. 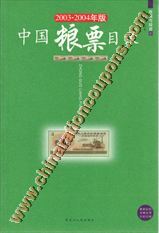 Wu zhi gong ying piao zheng jian shang yu shou cang, Appreciation and Collecting of Commodity Coupons, Zhang Shichun, 2008, 195 p., Hubei Province People's Publishing House. Structured according to topics, black and white pictures. shang hai ji hua gong ying piao zheng jian shang, Appreciation to the planned supply coupons of Shanghai, Sun Linxiang, 1997, 359 p. plus 10 tables, Shanghai Sanlian Bookstore. 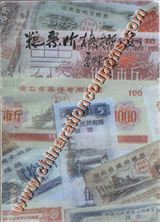 Superb oversize hardcover volume, all color plates, of all kinds of differrent ration coupons used in Shanghai by different issuing institutions. 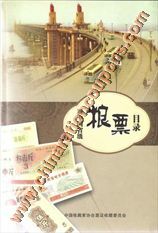 tai yuan gong jiao piao zheng shi hua, Historical Essays on the Public Transportation Coupons of Taiyuan City, Gu Min, 2007, 195 p., Taiyuan Public Transport Corporation. 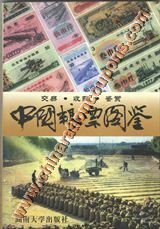 Zhong guo piao zheng da guan, China Ration Coupons Grand Overview, Sun Linxiang, 2003, 416 p., Shanghai Sanlian Bookstore. Phantastic oversize hardcover volume, all color plates, by the same author as the Shanghai book above. Tbe best documentation of one province's coupons. 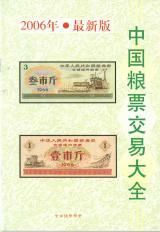 With grain and oil coupons from many different places and institutions within Shanxi province. 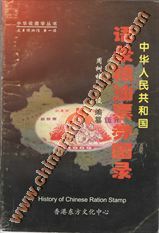 if you know some book about Chinese ration coupons, please let me know, with as much details as possible, so that I can find and offer it! copyright by David Holler 2011.